Talk about hip-pop, rap, gospel music, movies, and what have you; Queen Latifah is always a notable figure. The American rapper, songwriter, singer, actress, and producer has tasted all genres of entertainment and has indeed left an indelible mark in the industry, becoming an inspiration to aspiring entertainers as well her to her counterparts. She is not just known for her prominent and intimidating body, the rare talent has also got some impeccable skills which speak volumes. Queen Latifah will always be remembered for her hit single U.N.I.T.Y. which bemoaned the marginalization and segregation of women in the rap community. The rap queen is known for her advocacy of women’s rights which she boldly integrates into her song lyrics. Her real name is not Queen Latifah; here are lesser known facts about the unique entertainer. She was born Dana Elaine Owens on 18th March 1970, to her parents Lance and Rita Owens in Newark, New Jersey. She was nicknamed Latifah (meaning ‘delicate’ in Arabic) by her cousin who is a Muslim. Coming from a family of cops, Queen Latifah may have gotten her perceived fierce attributes from her family – her father and her older brother are both policemen. Owens started rapping while she was in high school, creating her first rap group “Ladies Fresh” at the time. Latifah released her first album All Hail to the Queen in 1989 when she was 19. The singer at the time was signed to “Tommy Boy Music” who fell in love with her skills after hearing her demo. Her first album had exceeded her expectations, selling up to a million copies. With the proceeds from her first album, she formed her own production company which she started on the ground floor of her apartment. Shortly after she formed ‘Flavor Unit Records and Management Company’ in partnership with her friend Shakim Compere. It was not going to be all about music; the talented singer appeared in movies like Jungle Fever, and Juice. She starred in Set it Off in 1996. She starred alongside Angelina Jolie in The Bone Collector in 1999. This was after she released her fourth hip-hop album Order in the Court, in 1998. Latifah was going to do more of soul and jazz music afterward. She soon got more involved in film and television. From 1991 to 2001, Queen Latifah hosted her talk show ‘The Queen Latifah Show’. In 2003, she was part of the comedy show ‘Bringing Down the House’, and other notable movies like Scary Movie 3, Barbershop 2: Back in Business and Kung Faux. In 2004, she implemented her plans doing soul and jazz with the release of The Dana Owens album. She then proceeded to star in the movie Beauty Shop in 2005. Latifah performed in July 2007 at a jazz concert held at the Holywood Bowl in Los Angeles. With a live Orchestra, she rendered a sound performance of already known songs. She released another album persona in 2009. Queen Latifah is basking in great wealth and is reaping the fruits of her hard work. The rapper and actress sits on an enviable net worth of $60 million which is expected to keep rising in the coming years. In her case, she is a master of all when it comes to entertainment and this has greatly paid off. For her role in the movie ‘Bringing Down the House’ Latifah earned a whopping $1 million as salary. This was nothing compared to that of ‘Beauty Shop’ where she earned $10 million. She also swims in a big pool of accolades garnered in the course of her versatile and stupendous career. Queen’s outstanding performances in both music and movie faculties earned her several awards and nominations. She has been nominated six times at the Academy and Grammy awards. She has tons of BET awards as well as some SAG, Actors Guild, Image awards and lots more. Queen has released up to seven studio albums which have all done well on national and international charts. Queen Latifah drew some attention to her self following a remarkable weight loss that became an inspiration to plus size women. Queen Latifah who has had the chubby signature look went from a plus size to a slim figure, to the surprise of many. With the help of Hollywood trainer, Jeanette Jenkins, Queen Latifah changed from a carefree style of eating to healthy eating and workouts. Jenkins drafted out a good work out plan for the rapper who also additionally hit the gym five times a week. According to reports, the daily work out plan was the type that made her lose up to 350 calories in about 35 minutes. She was also encouraged by her trainer to drink lots of water. Water, she explains, makes up 60% of the human body weight and so, if one takes more water than food, he/she will definitely lose weight. America mourned with the entertainer following the death of her mother, Rita Owens in 2018. Late Owens who had battled with a heart condition for over decade, lost her life to the illness in March 2018. Late Owens struggled with Queen Latifah through thick and thin as a single mother and a divorcee. 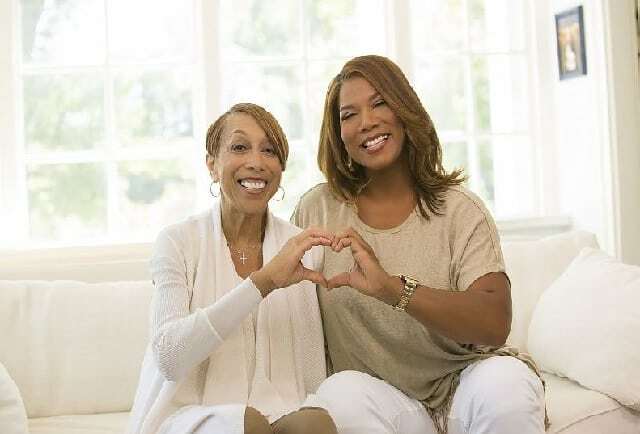 Latifah had grown fond of her mom whom she grew up with after her parents’ divorce when she was just 10. She revealed that her mother has been with her all through her ups and downs and have celebrated every milestone with her. Lots of condolences flooded the timeline of the bereaved singer and actress who kept on talking about her mother’s good works. There has been a seemingly unending fuss about the sexuality of the rapper and actress. Latifah’s alpha female characteristics, her bold looks, and other features gradually built a feminist and robust aura around her persona, giving the public, as well the media, room to speculate about her sexuality. It can be recalled that Queen Latifah’s remarkable lesbian role in Set it Off (1996) engaged the public more with talks pertaining to her sexuality. But Latifah herself seems not to be bothered about the rumors and assumptions. Moreso, she has neither confirmed nor debunked the rumors, giving the public more reasons to believe that she is gay. Although she is very private with her personal life, the rap queen has been linked with several women including Eboni Nichols and her trainer, Jeannette Jenkins. Having said that, the public continues to wait for a confirmation or refutation.